Good Sunday Morning! I hope your weekend is going well and that you're getting a chance to relax & enjoy some quiet time. My post for today is for an old sketch from SCS. I really like this one for it's ability to use your dp scraps.......gotta love that right?!! I also used an image I received from Wish-RAK and colored it with my SU! markers.....those mice are adorable but only in a stamped image LOL!! Hopefully I'll have time to create today amongst the laundry and re-cleansing of my stamp area.....yes, I'm purging again and feeling pretty good about it too!!!! Thanks so much for stopping by and have a great rest of the day!! This is adorable. That HM image is sooooo cute! I'm gonna be doing laundry too. After both of us being sick, we need to "wash those germs away". Ya think???? Wonderful job with the House Mouse...they are one of my favorite lines! Nice job with the sketch. Great card, and isn't it great when you get to use scraps up. How cute is this little mouse! Adorable card!!! 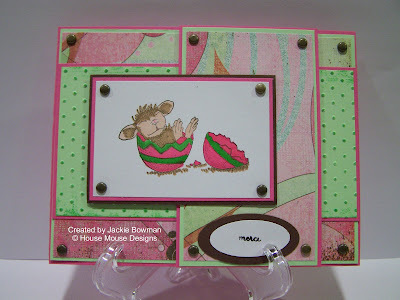 What a beautiful, pastel, spring, Easter-y card.....it makes me want to see green grass sooooo badly, lol! I love those House Mouse stamps! Jackie, this is so so sweet!! Love it! :) TFS! Your HM is SO cute! Can't resist those little guys! What a cute stamp! Great colors. How cute! I love your layout...might have to try it since I have lots of scraps, too! Did someone say SCRAPS? OMG, I have drawers full! This is so adorable, Jackie! I love the swiss dot grunged with green! What a good idea!! Oldie, but a goodie!! Awww, such a cute card! Very nice job! Sooo cute...love the HM image and the layout is awesome!!! When you finish purging your craft room, come help me with mine....it's such a mess!!! Now isn't he the cutest thing ever? You did a great job coloring him!